As we grow, so do our purposes and understandings. As I have awakened & transcended, so have mine. What started as a "blog" (here) to write that which I came to realize in my own head, reality and eventually, total expansion from within, turned into a purpose of assisting others on their own journey within. All sites are linked here, as they play a huge role in the overall journey of the evolving soul. As you grow through transcending the physical as you now know it, each will assist you in whatever "space" you currently are in. Welcome and so very honored to share. Here we explore one's SPIRITual awakening, soul growth (expansion) and the ascension process. We transverse the human mind & stretch the rational & logical mind beyond that which makes sense. For one to expand into their soul self, one must go within. This site offers tools not found anywhere else for this. How-To teach yourself tools, which is what all must eventually come to do. Releasing that which blocks your own remembering from within. This "Energy" activates, merges, integrates and raises one's vibrational frequency in every way, providing instant access to higher dimensional realms & frequencies instantly. 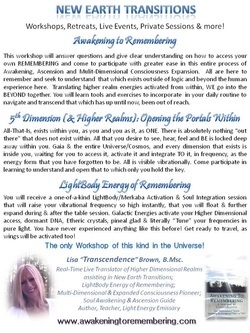 This opens portals within, removes blocks energetically and tunes one's overall frequency as one. It is an actual energy that has "come through" here to assist others in expediting their own ascension process by raising their entire vibrational frequency. It's like the "Energetic Chiropractor" plugging you into an electrical outlet, while releasing "low" vibrations during and after the session(s). One's vibration speeds up, internal world gains clarity, new connections & expansion all at one time! All have come here to "Remember" on their journey of Reawakening to that which has been veiled within the human mind. Simultaneously, the human sheds all and completely transforms energetically, to integrate into a BEing that goes BEyond human. A process of emergence, activation, integration, re-evolving, back into that which has been forgotten. A journey of light expansion from within; a cosmic connection that is reached through the heart. This site answers those unanswered questions that do not exist in the physical. We translate higher realm world energies here, from within. Because all of the sites overlap on some information, I have pages "directed" to where to locate certain information on each site. Simplifying while we expand and try to keep up!